MVS code 167.086.0(0) | T.SPARK 1.8 GUARDIA DI FINANZA, based on the T.SPARK 1.8 MEDIA (16V). In addition the GdF used min. one Q4 2.0 TB 4X4 SPORTIVA 93 and min. two Q4 2.0 TB 4X4 SPORT MY 95. Unlike the 1.8 these cars did not have the searchlight on the roof. According to Guglielmo Evangelista, expert of Italian car registration plates, the Alfa Romeo 155 has been used by the GdF since 1993. Until 1998 the GdF ordered approx. 1,900 vehicles. 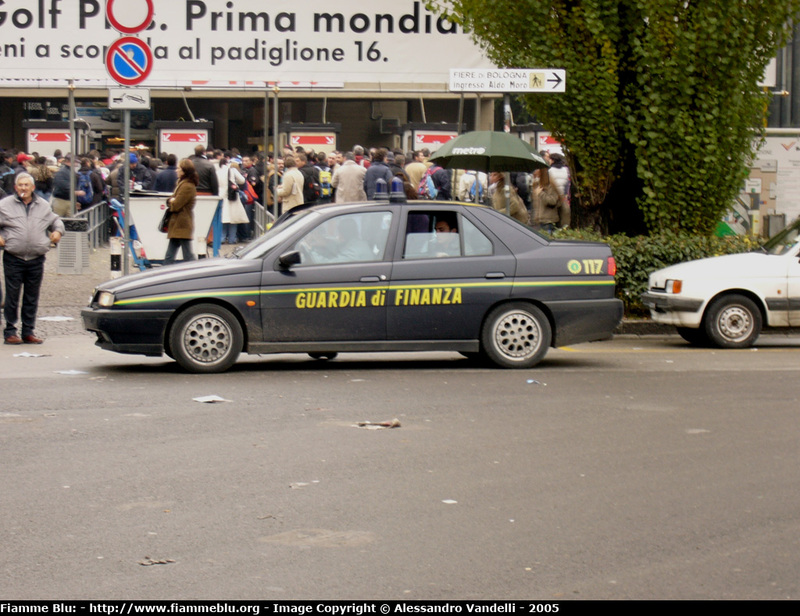 The 155 Guardia di Finanza is still in use. No. 438 Blu lord (Guardia di Finanza): T.SPARK 1.8 (16V) MEDIA. Note: missing searchlight. Photo courtesy of an unknown photographer. Note: missing searchlight. Photo courtesy of Alessandro Vandelli at fiammeblu.org. 1. Vandelli, A., fiammeblu.org: Forze dell'Ordine, Guardia di Finanza; 2009. 2. Evangelista, G.: Le targhe e i veicoli della Guardia di Finanza; 2003. 438 Blu lord (Guardia di Finanza) - website "Alfa 155 Club"